Williams writes with the same magnificent prose as in The Emperor’s Knife. I really love her writing, it’s so complex, so deep, intimate and lyrical. For both The Emperor’s Knife and Knife-Sworn this is a big plus. But this isn’t a book you can read easily, due to the complexity Williams puts in her writing, you really have to keep your head in the game ‘cause otherwise a lot of information will get lost on you. The book got off to a rather slow start, with a lot of random scenes describing the aftermath of the destruction of the Pattern and the Pattern Master on the people and on Sarmin. We meet the two new additions to the imperial family and there are some new mysteries introduced, this all mixed with a background of military, political and religious tactics. It could have used a stronger beginning to grab the attention of the reader right at the start, but I’m all for giving books a chance, so I read on without complaint. It took a while for the story to get a grip on me. In the first book I never really had a connection with the story, though it fascinated me. Around page 100 of “Knife-Sworn” I was finally drawn in and it didn't let me go. I don't know what changed, but there was some sort off click that made me immerse myself in the story. It was much easier to keep reading and to feel emotions while reading some of the chapters. Especially the chapter where Sarmin sees the memory of Gallan and how that ended really touched me. The unfairness of it all, the cruelty left a deep impression on me. Knife Sworn is, just as its predecessor, an intriguing and fascinating book. The author resolved the problem of the pattern at the end of the first book, but not all is well in Nooria. First all were connected with each other through the pattern, sharing grievances, pain and joy alike, but now everyone's abruptly alone again. This loneliness haunts the citizens of Nooria and it is referred to as "the Longing". People take drastic measures to escape this longing (suicide, drugs,...), but out of the desert comes an old faith, banished from Cerana years ago, promising to unite the people once again. But is there truth in this promise? And with people desperate for a new connection with their fellow Unpatterned, is there any way to stop it when there's something darker beneath the smooth words of the Mogyrk priests? To top it off, The Longing is not all the Pattern has left behind. At each anchorpoint used by Helmar for his Pattern, a nothingness is consuming everything in its path. What is it, and can it be stopped? 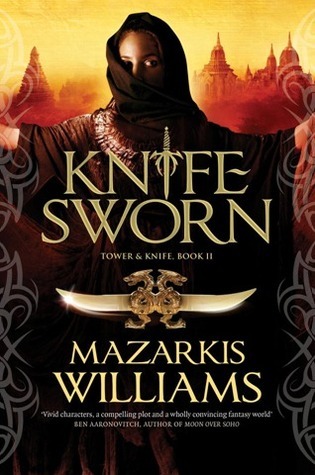 Lots of intrigue and mystery in this second book of the Tower and Knife series, just how I like it. And this time I did connect with some of the characters. Williams gave more dimension to her characters, showing sides that were hidden in the first book and created more depth. The author sets yet again a scorching pace, with twists and turns every few pages, throwing obstacles on our character's paths and introducing questions that trouble character as well as reader. Though in the first book the pacing was a bit too fast to my liking, I had no problem with it this time. As always amazing review from the number one Fantasy lover in the whole world, sure I will read this sires (because of your reviews) . I got Knife-Sworn on Netgalley last year, it's archived by now, so you can't find it anymore. It took me a while to read it because I was waiting 'till I could buy the first book "The Emperor's Knife". I'm glad you liked the review!